Featured on the home page is Hot Dog - Here is his story, he is just one of thousands of Horses helped by Evitex. I just had to write and thank you so very much for your product EVITEX. 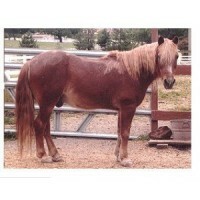 My pony, HOT DOG is 20+ years old. He was diagnosed with Cushing's in January. I started the pergolide per my vet's instructions and after 3 months there was NO difference. There is nothing worse than seeing your long-time companion in the middle of April sweating because he can't shed his winter coat. After 3 days on your product he started shedding! Within 3 weeks he was completely shed out except for a few little wisps. I can't tell you how grateful I am. I have also started using the product FORMULA 4 FEET and the SPEEDI-BEET with outstanding results for his laminitis. Thank you so much for your research and commitment to equine health.